Play These Games : 101 Delightful Diversions Using Everyday Items is one of those practical idea type of books. Heather Swain uses basic household items (such as balloons, buttons, beans and even books!) to create fun diversions for little ones. If you aren't very creative when it comes to thinking up ideas for games your kids can play (with you, by themselves or with others) than this might be a useful book for you to browse through. I also rather think this is the type of book that a preschool through grade school teacher might like to have on hand to work game playing into their classroom. In Play These Games , Swain begins by talking about the important role that games play in the lives of children. She argues that games teach socialization skills, and also contribute to brain development. She provides a basic list of materials that she uses in this book - most of which are household items. For every item she lists (e.g., a button or hoola hoop) she gives you about five or six game suggestions. The explanations and instructions for the games are extremely easy to understand and are frequently accompanied by black-and-white drawings to help illustrate her directions. 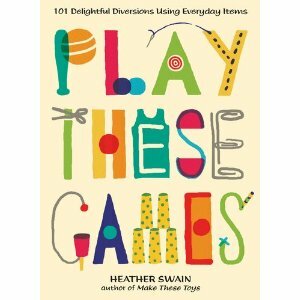 Play These Games is a practical guide, encouraging you to look around your house for objects to entertain your children with. In a day and age when the idea of entertainment generally centers around buying lots of toys to clutter your house, it's refreshing to see books coming out which encourage you to make use of things that you already have. Such a book builds contentment and really plays (har, har) to the idea that a family who knows how to have fun together has everything that they really need already. That's a message I can get behind. If this book sounds like something that you or someone you know might be able to make a lot of use out of, I'm happy to inform you that Penguin Books has offered to give one copy of Play These Games to one of my readers here at Reading to Know. To win? Simply leave a comment below (including a valid e-mail address!) This contest will be open through Monday, May 7th and is open to U.S. Residents only. THIS CONTEST IS NOW CLOSED. THE WINNER, as selected by Random.org, IS #5- MIKAILA! Congrats! Many thanks to Penguin Books who kindly sent a copy of this book my direction, and who generously offered an additional copy to one of my readers! Looks like fun! Sign me up! My Dad had this game that we all played together when we were ready for church on Sunday morning and waiting for Mom and the baby to be ready. (haha... it was also an incentive to be dressed, ready, and have eaten breakfast early) He hid a red thimble in plain sight (so you didn't have to move anything to find it) and we wandered around looking for it. If you saw it, you had to run and sit on the couch and shout "huckle buckle beanstalk" before anyone else. Then you got to hide it. What a FUN and useful book! Jordan tried telling me last night that the TV "isn't always on" and that he just has "nothing else to do". Uh huh. Thank you Carrie! I'm always on the look out for new games to play with our two sons. Thank you for the giveaway...love new ideas for fun times with the kiddos! What a neat idea. It's always great to have an abundance of game ideas up one's sleeve. This book looks interesting to me because I'm in an anti clutter/toys phase right now. What a fun book! My dad and I used to play a rhyming game, finding absurd words and trying to rhyme them with other words. I am so uncreative about games. It seems like we just play the same ones over and over! I would love this resource for at home and at church! I'd love to win this! I'm always looking for ideas for games and creative play for my three young cousins. Thanks to your review, this book caught me eye last week in the new books section of our library. Haven't had a chance to crack it open yet, but looking forward to being inspired!